Working in medicine doesn't necessarily require that you spend the majority or even the entirety of your twenties in school. Physician assistants do some of the same work that physicians do under the supervision of a doctor. They can treat some wounds, reset broken bones, interpret test results, and administer medication. Physicians often extend some of their authority to physician assistants (PAs). Joining the military offers a few qualified individuals a chance to skip ahead a bit and earn free master's degrees and potentially jobs as physician assistants. The Interservice Physician Assistant Program (IPAP) gives service members a shot at a career in medicine. The military services came to the commonsense conclusion in recent years that they should pool their resources and train their medical personnel side by side because they were offering essentially the same jobs in the field of medicine. IPAP was subsequently born. This is not an entry-level program. You must first be accepted for service in the U.S. military and you must serve honorably. You must effectively prove yourself worthy and eligible for IPAP. Seats are limited each fiscal year, so there's no guarantee you'll be accepted even if you meet the requirements. You must meet security clearance requirements and be younger than age 42 at the time you're commissioned. You can't hold down off-duty employment during the time you're attending IPAP. You must have completed at least 60 semester hours in college science courses, be currently certified in basic life support, and have taken the SAT test. IPAP is located at Joint Base San Antonio in Fort Sam Houston, Texas. In total, the IPAP training program lasts about two and a half years. This road still takes plenty of time, but that time is spent in the service with full pay and benefits—a big difference. The first year and four months of IPAP are spent in a classroom setting in San Antonio. You'll build from a foundation in anatomy, physiology, and chemistry through a detailed study of body systems, medical disciplines, examination techniques, and clinical thinking. The remainder of IPAP is a "clinical clerkship" that is spent working in a variety of specialty areas at military treatment facilities across the nation. IPAP students also develop and refine a master's thesis paper throughout both phases of training. It's presented at the conclusion of the program. Successful graduates can then take the Physician Assistant National Certifying Examination (PANCE) to earn their licenses and begin practicing in their branch of service as a PA. A description of IPAP offered by the Naval Association of Physician Assistants claims IPAP students "have a 99 percent pass rate with a mean PANCE score consistently above the national average." 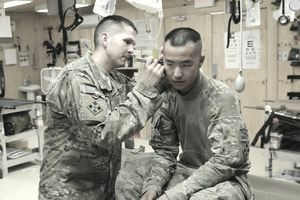 Each branch of service publishes slightly differing requirements for its physician assistants upon successful completion of IPAP, but military service is typically just the tip of the iceberg. You must also meet the standards for acceptance as a commissioned officer. You must be a U.S. citizen and be between the ages of 21 and 48, although age waivers are sometimes granted to those who served in the military earlier in life. Those who previously served can provide a copy of their DD214 Records of Service. Some additional documents might be requested. You must already have a bachelor's degree. You must be a graduate of a training program that's accredited by the Accreditation Review Commission on Education for the Physician Assistant, and IPAP qualifies. You must be certified by the National Commission on Certification of Physician Assistants, and you must be able to pass the ECLT, the English Comprehension Level Test, if English is your second language. Physician assistants who have served honorably can apply for fully funded postgraduate training. Available fields include occupational and emergency medicine as well as orthopedics.